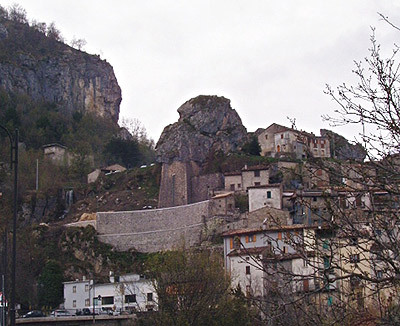 Village built on the slopes of the Corno Piccolo, secondary top of the Gran Sasso, carried for centuries the name of Petra Cimmeria, perhaps from the Cimmeri people who came from East or because of the camel shaped rock that overhangs the village. The most ancient date that gives the existence of Pietracamela is 1452, wrote on a plaque on the portal of the church of San Giovanni. However the zone was already inhabited during the Roman age as demonstrated by three distinguished villages: S.Leucio, Plicanti and Rioruso. In the Middle Ages, with the advent of the Angioini and the Aragoneses, Pietracamela belonged to the Orsini family in order then to pass later to the Reign of the Two Sicilies under the dominion of the emperor Carl V, heir of the Aragonese reign. A visit to Pietracamela comprises the church of San Giovanni (1432), the sail shaped bell tower, the ancient meridian and the clock; the church of San Rocco (1530); the casa de li Signuritte, with mullioned windows of `the 400; the house of don Ioani of 1505. She arches, alleys in stone, balconies and the old Fontanas accompany the visitor between these places..